After months of debate, we are excited to reveal our 50 Providers to Know and 50 Providers to Watch for 2017. At Spend Matters, we routinely review the latest procurement technology and service offerings. This uniquely positions us to help you with your vendor selection process. The 50/50 lists are the result of intense debate, discussion and refinement among all of the Spend Matters analysts and reflect our unbiased, independent view of the organizations you should know and watch. Don't forget to register for our upcoming complimentary webinar, Vendor Intelligence: Spend Matters’ Providers to Watch and Know in 2017, featuring Jason Busch and Pierre Mitchell. 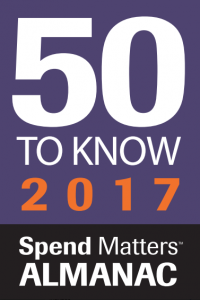 The Spend Matters 50 Providers to Know highlights firms that continue to lead the charge for new procurement technologies and services, driving innovation and changing the way we do business. The 50 Providers to Watch lists shines a light on exciting newcomers that are pushing the envelope. 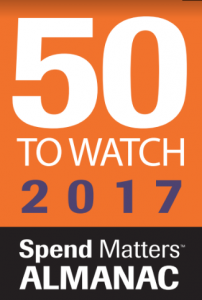 Visit the Spend Matters Almanac to access detailed provider listings or to add a listing for free.The providers on the 50 to Know and 50 to Watch lists will be featured throughout the year and in the Spend Matters Almanac. The Almanac is a vendor intelligence directory for modern procurement covering more than 24 categories and featuring more than 360 solution providers (and growing!) — including our unbiased reviews — and serves as a resource for anyone interested in our view of the procurement service provider landscape. While people can debate the list and who may have been left off, I can say that I’m excited about the focus, innovation, and market momentum in the space. Maybe I’m wrong, but I don’t think we could have filled a single 50 company list back when a few naive guys together to start Coupa. Congratulations to all the vendors who continue to plug away, the Spend Matters team who have been a voice in this space for so long…and definitely to the procurement professionals who are finding more and more ways to deliver value to their business! Another round of furrowed brows over, congrats! BTW, a nitpick, for consistency’s sake, shouldn’t that be IQN/Beeline? Starting in April, Beeline and IQN began operating solely under the Beeline brand. Henry: MarketDojo is an excellent firm. It is one in a crowded market segment, though. For those wishing to sort through how it fits in, this is a link to our PRO research covering MarketDojo. Thank you for your comment. 1) For those that may be wondering about “To Be Determined” on the ‘Watch” list, this is not a mistake! We left one “Watch” list spot open … to be unveiled at a (near) future date by the Spend Matters research team. 2) It always comes up so I’ll tackle the question here: the 50/50 list for 2017 represents precisely 50% Azul Partners / Spend Matters clients and 50% non clients at the time of selection. No, we did not intend it to work out that way, or anyway, for that matter! I could be called biased here but missing out Market Dojo on either list is a travesty! Market Dojo as a sourcing and auction platform is changing the market and leading the charge in the on-demand model.